"DOC" JOHNSON'S TRAVELLING MIRACLE MEDICINE SHOW! In the days before the automobile, radio or television, traveling medicine shows brought entertainment to small towns and communities that often had no other form of professional theater available to them. While we think of the old time traveling medicine shows as being part of the wild west, they were actually prevalent over every part of the United States. The heyday of the medicine show was the 1890s, when there were approximately 125,000 such enterprises doing business across the 44 United States. Programs often consisted of music, comedy and magic, with a fair dose of melodrama when the sick were "cured." The shows were free; the pitches for medicine were the "commercials" that audiences had to listen to before the show could continue. A show could be comprised of one person or a troupe of several dozen entertainers and assistants. The type of show "Doc" Johnson presents is a typical one-man show. While it's impossible to present everything 100 percent accurate to the time period, "Doc" does his best to keep in the spirit of the entertainment presented in the late nineteenth century. 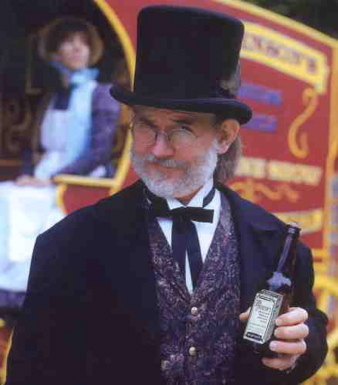 The jokes are corny, the magic is simple and the music questionable -- but the elixir "Doc" sells is of the finest quality available to mankind that science could create in the 1800s. The show is family-friendly and a great addition to any folk festival or history-oriented event. "Doc" is also known to give college-level lectures on the history of the medicine show, and can be persuaded to act as master of ceremonies for public and corporate events.